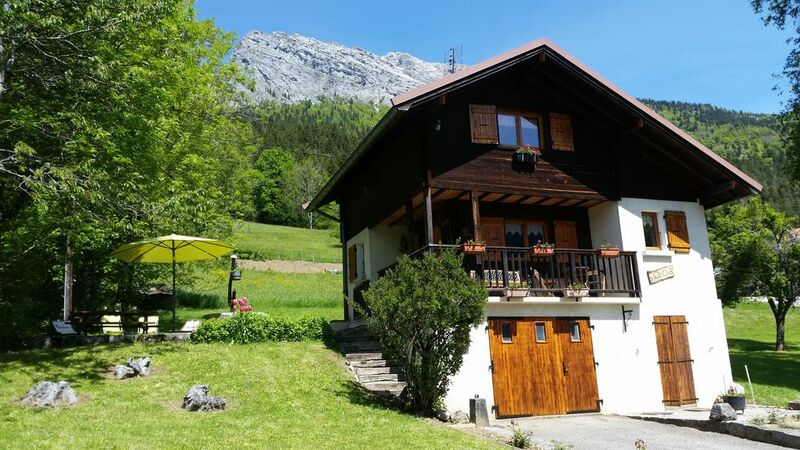 Chalet classified 3 stars by Les Meublés de Tourisme de France for 4 to 5 people located in the heart of the Aravis at 800 m altitude at a place called 'Lachat' in Thônes. 20 minutes from Lake Annecy and 45 minutes from Geneva. We loved our stay during New Years Eve. . The chalet is situated on the sunny side of the valley. The weather was brilliant so we took full advantage of the extra light. Its located along a very quiet road. Its small but very practical. We stayed with 2 'grown ups' and two teenagers. Kitchen is full equiped, sanitary is basic but thats all you really need. It is very well kept, clean and tidy. Supermarket is a 7 min drive away. They have lots of storage for food, two fridges and a good size freezer. Washing machine and WIFI with good streaming capacity. Great value for the money. The owner is a very nice person. No problem to contact in case of any special needs. We loved hiking near by, skiing and cross country skiing is only 20 min drive away. We will return because there is still so much more to explore. We stayed here 2nd week of September and we loved every minute of it. We were sad to leave because the chalet is in a lovely quiet valley with wonderful views of the mountains all around.The chalet is very nice.Previous comments say that the kitchen is too small but myself & my Husband coped very well together in it sharing the cooking & washing /drying up. (There is a dish-washer but didn't feel the need to use it).The kitchen is actually very well equipped indeed.Great choice of pans,frying pans,oven-ware & there is even a fondue! The rest of the chalet is well layed out.There were only the two of us so we didn't need to use upstairs with the three beds,a cosy sitting area with TV. Upstairs in an ideal space for 2/3 children or teenagers to chill out whilst parents are preparing an evening meal.The garage is an excellent added bonus to store excess luggage & also has a second fridge freezer if you want to buy food en masse for the week.The garage space is also a fantastic space to store your skiing clothes etc. Herve,the owner was a nice guy.He was only a phone call away if there were any problems.....which there weren't. Absolutely nothing to complain about. We were sad to be leaving & would definitely return to this chalet in the future. Great holiday!!! We loved it and don't understand the previous review. It is compact but what else do you need? It has all the facilities you need, its in a great location about 25 mins drive to Annecy. Great views all around, walking on the doorstep and the cycling is fantastic. There is a steep climb from the main road which is interesting after a long bike ride but it all adds to the fun of being on a mountainside. It's stunning really, and the chalet is very comfortable, beds, kitchen facilities, BBQ etc. All good in our view. Very relaxing place to stay. Friendly welcome too from Herve. Our best holiday in France after 20 years visiting. Jamais eu aucun soucis, à part cette année, avec des anglais irrespectueux et surtout sales !!! Poubelles laissées à l'extérieur et bien sûr pas triée, wc et salle de bain dans un état excécrable, vaisselle dans l'évier ( du jamais vu !! ), frigo, four et plaques vitro-céramique crasseux, mégots de cigarettes sous un lit, couvertures souillées, lits refaits n'importe comment. Nous avons échangé de nombreux sms et je leur ai fait part de mon mécontentement !! Avons trouvé un joli chalet bien équipé , bien situé ,dans un endroit très calme , avec une vue extraordinaire sur les montagnes encore enneigées , avec un ciel bleu sans nuages pendant 2 semaines ,un plus ! Merci à Mr Agnans pour sa gentillesse et son écoute . Nous recommandons .